Dark matter is like the hidden part of an iceberg found below the water line. The hidden part is the dominant portion of the mass and supports the structure apparent from the visible portion above. Dark matter couples to ordinary matter through the gravitational force. The ordinary visible matter, which we detect through light from galaxies and stars, is analogous to the portion of an iceberg above the water line. Why is dark matter important? It dominates the mass-energy density of the universe during the early part of its lifetime. Just after the epoch of the cosmic microwave background (CMB) the universe is composed of mostly dark matter (dark energy comes to dominate much later, during the most recent 5 billion years). But also there is the ordinary matter, which at that time is a highly uniform gas of hydrogen and helium atoms, with slightly overdense and slightly underdense regions. The existence of a large amount of dark matter promotes much more efficient gravitational collapse of the overdense regions. This is a self-gravitational process in which regions that are slightly denser than the critical mass density (which is also the average mass density of the universe) at a given time will collapse away from the overall expansion that continues around them. Both the dark and ordinary matter in such a region collapse together, but it is the ordinary matter that forms the first stars since it interacts via various physical processes (think friction, radiation, etc.) to a much greater degree allowing for collapse. The dark matter, interacting only via gravity and perhaps the weak nuclear force, but not through electromagnetism, remains more spread out, more diffuse. The dark matter promotes the collapse process though, through increasing the self-gravity of a given region and this results in more efficient formation of stars and galaxies. There are many more stars and galaxies formed at early times than would be the case in the absence of substantial dark matter. From cosmological observations including the CMB and high redshift (distant) supernovae, we find dark matter is about 1/4 of the mass-energy density of the universe. 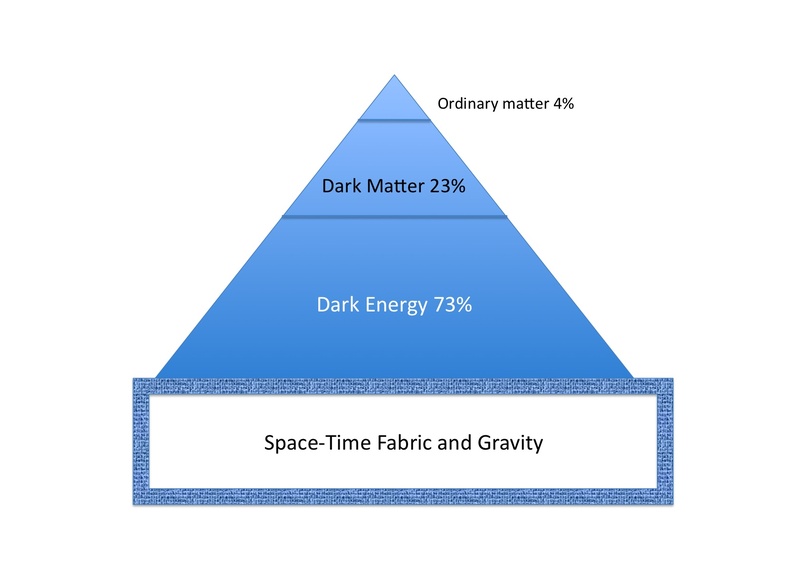 Dark matter is composed of either faint ordinary matter or, more likely, exotic matter that interacts through the weak and gravitational forces only. Dark matter is clearly detected by its gravitational effects on galaxy rotation curves, and is inferred from the kinematics of clusters of galaxies and the temperature measures of X-ray emission from very hot gas between galaxies in these same clusters. Dark matter is also detected through gravitational lensing effects in our galactic halo and in very large-scale cosmological structures. The abundance of deuterium, which is produced from Big Bang nucleosynthesis, in conjunction with the universe’s now well-known expansion rate, severely constrains the density of baryons (amount of ordinary nucleonic matter, i.e. protons and neutrons) in the universe and leads to the conclusion that over 80% of matter is nonbaryonic. The MACHO (MAssive Compact Halo Objects) alternative, which refers to potential ordinary matter, is thus limited. The WIMP (Weakly Interacting Massive Particles) contribution is dominant. Hot WIMPS (e.g. neutrinos) are ruled out because they inhibit clumpiness and galaxy formation in the early universe. Cold nonbaryonic dark matter is the best candidate, with the primary candidate being an hypothesized, undiscovered particle. Neutralinos are thought by many particle physicists to be the best candidate for this, and have an expected mass of order 50 to 250 times the mass of the proton. It must be emphasized that no neutralino or similar particles (known as supersymmetric particles) have ever been detected directly. It is hoped that the Large Hadron Collider newly operational at CERN near Geneva may do this. The next decade should allow us to shed new light on dark matter. Whatever it is made of, without the existence of substantial amounts of dark matter, there wouldn’t be nearly as many stars and galaxies in the universe, and we very likely wouldn’t be here. This entry was posted on Monday, April 4th, 2011 at 7:02 pm	and tagged with Dark matter, MACHOs, neutralinos, WIMPs and posted in Dark Matter. You can follow any responses to this entry through the RSS 2.0 feed. There is no need or evidence for dark matter – it is just speculation/assumption that Newton’s law of gravity is also valid outside our solar system. Gravity itself is dark and is only observed by its action on visible objects (apples). When attempts are made to validate/apply Newton’s law for observations at cosmic distances it fails unless vast amounts of invisible/dark matter is invoked. This was the case of the observations by Vera Rubin of the unexpected flat/constant rotations of stars in spiral galaxies. Dark matter was used as an explanation. The earlier observations of Fritz Zwicky for the motion of groups of galaxies could only be explained by vast amounts of missing matter to supply the necessary gravity. Actually the observations of V. Rubin plus the equations for outward rotational force (centrifugal) and the inward gravitational force gave a basic balancing equation: M*G=r*v*v which for the observed constnt velovity v reduced to M*G as a liner function of distance at galactic distances for r.
Rather than assigning the linear dependence to the mass requiring dark matter, it is more logical to assign the linear term to gravity which is already invisible. Thus no need for the mystery of Dark matter.